Robson Maternity Home, Esk House, Bowesfield Lane c1965. (c1920-1968). A Volkswagen Beetle and a Ford Cortina are included in the view. I was born here on 8th October 1944. We lived at 8 Northall Street. I believe this no longer exists. My father was in the army and mother was too before she had me. At that time we lived with my grandparents John and May Inns. We then moved to Bristol to be near my father’s family. Is this building still there? I was born here on the 18th July 1956 and my brother on 31 January 1951. We lived in Redwing Lane, Norton. I was born here in 1956, attended the then nearby Bowesfield Lane school. Lived in Adam Street, Tees Bridge. – Memories. I was born in Robson Maternity Home on 7 June 1947. Derek Arthur Redfearn on 7th June 1944. I was born here and spent most of my working life in Bousfield Lane. I was born in February 1968. How long was it open for after this? Hello, I am Sandra Dover. I was born there on August 27th, 1952. So glad to find this site. I am a ten pound pom who was born here in 1966, 1st of May. (Maypole day} My name is Heather Ruth Marsh. My mum told me I was born with a crop of thick red hair so the nurses nicknamed me carrot top. There was a little boy born at the same time with a thick crop of black hair. They nicknamed him basil brush. I emigrated from Stockton in 1968 to Australia. I have found this site wonderful to hear through the words English voices. I was born on a Thursday. Thursday child meek and mild. Thursday’s child has far to go, and in your case Australia which is pretty far. Friday’s child works hard for a living. Saturday’s child is loving and giving. and the child that is born on the Sabbath day is bonny and blithe and good and gay. Friday & Saturday should be other way around…Friday’s child loving and giving, Saturday’s child works hard for a living. I too was born at the Robson in January 1948,l was my parents third child. My mam died in 1964 and l wished I had asked her why as my 2 older siblings were born at home in Norton.Then in February 1949 my sister too was born at home. I went on to have my second child at the Robson in 1967. I was born here in 1961. I was born at the Robson in December 1932, we lived in Chalk Street nearby, my first son was born there too in June 1952. I remember that it was so busy that he was born in the nursery as there was no room in the delivery room. I was born in the Robson on the 07 July 1949. Someone I later went to Grangefield Grammar with was born there around the same time and his name was I believe Ian Dack. I was born in The Robson Maternity Home on 8 January 1963. My parents Jack and Florence Meek lived in Eaglescliffe at the time. I now live in Yarm with my husband Vince and children Andrew and Rachel (who were born at North Tees Hospital). I have a younger brother (Howard) who was born at home because my mother said that at the time the 2nd child was normally born at home. I remember my mother saying that the winter of 1963 (when I was born) was a particularly bad winter and that my father had an accident in the car when travelling to the hospital to visit my mother. When my parents took me home they put me to sleep in the airing cupboard because they fearing for me because of the cold weather. My daughter was born there June 1st 1967. My aunt lived a few minutes walk away in Ellicot Street. I was born there in 54. My father keeps telling me it was in Thornaby. He is a Yorkshire man and wanted my mam to go to Middlesbrough and for me to be born there in case I was good at cricket. I was but that’s another story. I was born in the Robson Maternity Home in 1944, as well as my sister who was born there in 1947. I have lived in the US since 1965, however, I visit Stockton every year. I was born here October 1953 ! obviously one of many…all very nice people! My son Anthony was born in the Robson Maternity home on Christmas day 1963 and I was wondering if anyone had a copy of the picture from the Evening Gazette. I think there were 7 babies born on that day. I was born here in 1953. My mother was unmarried and I was adopted so it was many years before I found out where I was born. I also discovered I had been a twin but she was stillborn. I have tried to find out what happened to her afterwards but it is so long ago. The midwife on the stillbirth certificate was M A Nixon. I don’t suppose there is anyone who would know what happened to her, but I would love to know where she was buried. @Izzybowles. It was the custom then to bury still born babies in a freshly opened grave that was awaiting ‘a deceased persons burial’, the baby but would be placed in a corner of the grave with no one none the wiser. What’s important is that by law a record must be kept of the internment, so by using your date of birth in 1953, and the place of birth, then finding the nearest, or 2nd nearest cemetery to this maternity home, Oxbridge for instance, then by looking at the burial records for that period in 1953, you should be able to trace which grave was used. I know this because in 1941 my brother was killed in a road accident, he was buried in Thornaby Cemetary, and when my mother applied to reopen the plot for my fathers burial, she was informed about a still born baby buried there, this was the first information she’d heard about it. (Stockton Burial Records for Durham Road Cemetery 1894 – to present, and Oxbridge Lane Cemetery 1871 – to present are online, for known, named persons burials. I was born in Robson Materniy Home, December 1961. My sister was born in June 1957 we lived in Wren Street, Oxbridge. I have moved to many places but have now returned to Stockton. My daughter was born there on 22nd March 1966 and it was so crowded that I slept on a camp-bed about 8″ off the floor, at the foot of two beds in one of the double rooms. I was born in the Robson on 16 Feb 1949, we lived at Portrack at the time. I was born here on 13th November 1956. I was born at the Robson in January 1950. In the late fifties, I visited the Robson with St Peter’s church choir at Christmas to sing carols (followed by Stockton and Thornaby Hospital further up Bowsfield Lane). Until 1969, I lived with my parents in Kensington Road, on the other side of Spring Street railway bridge. I was born here in January 1966. My brother and I were born here, me in June 1966. I was born in the Robson Maternity Home on the 27th Feb 1955 and I would like to know if there is a written history of this home, I am doing my own families history so any information on the home would be very helpful. I was born in the Robson Maternity Home in 1961. I now live in Leeds. I was born with a laryngeal web on my voice box, it was very rare at the time. I was wondering if anyone who worked at the Robson remembers me? I wish I could look at my records. I’m another one born here on 2nd February 1960. Does anyone remember Church’s Gent’s outfitters in Bowesfield Lane? It was run by Eddie Church who lived with his lovely family opposite us in Seamer grove in the 60’s and early 70’s. Eddie’s wife Marjorie ? (As a kid I only knew her as Mrs Church) was a teacher at I believe Mill Lane School. They had two girls, Linda and Julie, who both married and left the area and will be in their mid to late 50’s now. Does anyone know of the girls whereabouts or is in contact with them? I have a Territorial Army long service medal that was Eddie’s and he gave it to me as a youngster and I think it really should be back in their possession. I was born here March 20th 1963, we were living in Christchurch at the time. I was born in the Robson on 13th October 1961. We lived in one of the ground floor flats next to the Summerville Garage & opposite the Horse & Jockey on the Durham Road. Dad worked at ICI Billingham unitl we moved down south to Cambridge when I was about two. Last time I visited the Robson was undergoing refurbishment, while the flats were derelict & boarded up. Hi Margaret, We are trying to trace any relatives of my wifes Grandmother Elizabeth Ann Peacock(deceased) and were wondering if you are related. She lived at 3 Cosby Terrace Port Clarence in 1934 ? Any info would be useful. Thanks. I was also born at the Robson in March 1949, my family lived in old Camden St, now gone. My grandmother was a cleaner at the Bowesfield Pub. My brother was also born in the Robson in late February 1955, he was born on Pancake Tuesday during a snow-storm. I had to run down to the Robson each lunch-time with hot food for my mother that my grandmother had prepared. I had to ring the bell and wait on the door-step until someone came and took the food from me, I was not allowed to see my mam, I was only six years old at the time. My mam told me that she was not allowed to smoke while she was confined, even in those days, so she use to stand on the toilet seat, with her head out of the window and have a crafty fag. We moved to the new houses in Portrack when my brother was four weeks old. I was born at the Robson in 1968. I’ve made a Facebook group for those who were born there. Search facebook groups – ‘I was born at Robson Maternity Home, Stockton-on-Tees’. I WAS BORN AT THE ROBSON ON THE 6th NOVEMBER 1952. MY DAD ROBERT & MUM OLIVE KIRKWOOD nee HIBBINS LIVED IN WOODLAND STREET WITH RELATVES BOB & BESSIE HOGG TILL 1954, WHEN WE MOVED TO FALKIRK. I HAVEN’T BEEN BACK TO STOCKTON FOR APPROX 45 YEARS. STILL REMEMBER ROPENER PARK THOUGH. I was born here in May 1960, my parents lived in Walter Street on the other side of Yarm Road, my mother was Ethel Buckingham nee Gilbraith. I was born in Robsons Maternity Home on Coronation Day May 12th 1937. My father Stanley moved the family to Stocksbridge, S.Yorks in 1939 to be employed in the stainless steel trade. Just to carry on from Aline Chapmans comments, my wife gave birth to our daughter Karen on the 6th July 1967 in the Robson and I was one of those workers, during the few days she was in, when passing I would run up the path to the left hand window which she could open, for a sly visit, all be it from outside. Ah Memories. I had my daughter at the Robson on the 23rd May 1967. I went in when it was hometime for the workmen who were walking down Bowesfield Lane from Ashmores. I had to make my way through them all in heavy labour and my baby was born soon after. It’s funny how these things stick in your mind. Hi Gordon, yes I am the wee gal who used to walk through the spray shop on her way to school. My uncle is Jack, and still around at 89, like me he and his wife and family moved north of the border to bonnie Scotland. I to was born at the Robson in 1949. Pam are you the Pam Dinsdale who used to walk through the garage when I was an apprentice there from 1958 until 1961. I think you were about thirteen or so, your dad was Billy Dinsdale if you are the person I think. I believe your grandad was Fred, and the other Fred Dinsdale your uncle. Nice to hear you are fit and well. I remember Pam from Dinsdales Garage at Stockton when she lived at Yarm. I saw her in Glasgow where she now lives married to Dr Robin Anthony Painter, a chemical engineer who is retired but still travels the world working in Venezuela, Cuba, India, Middle East even though he is retired. Very busy and still takes three holidays a year abroad, lucky Pam eh! Yes I too was born at The Robson in April 1946. 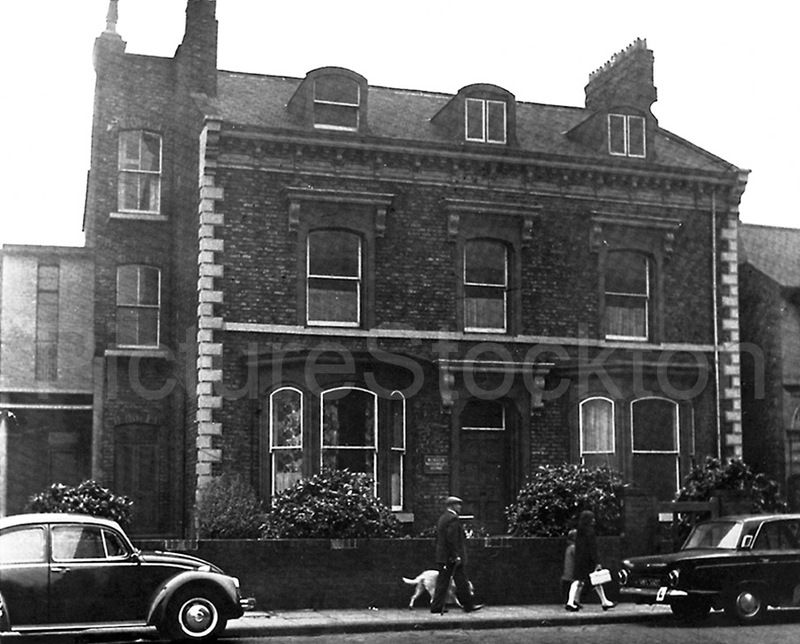 Barton House, in Yarm Road, which became a Solicitors office was private, ie you paid to be there. My sister was born at home, above the shop Dinsdale’s garage on Yarm Lane. I was born in the Robson on the 21st November, 1950. We lived in a prefab in Berkshire Road, Norton but moved to South Wales in 1952, where I still live. But I’m planning on coming back asap! I was born there on 30 August 1956 to Thelma Raw. Not sure if it has already been mentioned but I was told that there is a hotel on the grounds called the Stork Hotel? My mam, Audrey Watson (nee Hill) worked at the Robson before her marriage and up to me being born in 1956. She has fond memories of her time there. I was born november 1956 in Robson Maternity home. My name is Gwen Stockdale. We lived in Hartington Road Stockton . My mams name was Mary Stockdale maiden name Hunt. Dads name Jim Stockdale. I went to Bowesfield Lane school until I was 10 then we moved to North Lincolnshire with my Dads work. As far as I’m aware, and I used to live round the corner from this building and attended the youth group, Stockton Sea Cadet Corp, right next door to this building, this was never classed as a hospital but was an official maternity home. Splitting hairs I know but Stockton-on-Tees seems to have lost far to much of it’s modern history. Stockton & Thornaby Hospital was further along Bowesfied Lane oppostie what was Bowesfield Lane School. Again right opposite the boys end. My grandmother, Evelyn Stoker, gave birth to my father, Clifford, in this hospital. Her sisters were Ada, Margaret, brother Harold – would anyone know of them? They lived on Norton Road. Does anyone know if there are any records kept re hospital births? My step-grandad was Ernest Craven, maybe you recollect his name from Stockton also? Any information would be lovely to hear. I was born there 24th Nov 1946. My mother Alice and father Roland Smith, lived at 2 Stoker Street with my brothers William (Bill), David and eldest sister Valerie. All born there. Stoker Street was at the bottom end of Dovecot St. We later moved to 3 Blacksail Close on the Wrensfield Estate. My daughter was born in the Robson, Mandy Jayne Charlton born in 1966. It was a lovely place to have a baby, and yes you did have to stay in for 10 days, which I sometimes think wasn’t such a bad thing as you had time to really get to know your baby, and there was always someone to give help and advice when needed. Something that would benefet a lot of young people today. Born at Robson maternity home, November 18th 1959. My two older brothers, myself and our younger sister were all born in the Robson, 1940, 1943, 1948 and 1958, as were a lot of people in Stockton. My husband was born in 1949 in the West End Nursing Home which was a private nursing home, wasn’t that in Rosalind Terrace? Evelyn Stoker who lived on Norton Avenue,Norton. Maybe you knew her?.Would anyone know if any records were kept regarding births and their parents?. I have only just obtained my fathers birth certificate and am now attempting to locate his fathers name..
Hello. My mother Mary Campbell had a little boy around that time I wonder if you are he? When I first saw the photo it certainly looked like a working class neighbourhood of terraced houses that would not have had any domestic servants. Since both sides of my family (myself included) are from Cheshire, I have to assume that it was my biological grandfather who had some connection with Alexandra Street. Exactly what that connection was, will probably remain a mystery. Alexandra Street in Stockton was off Oxbridge Lane, behind the row of shops – next to Mary Street, where there is now a small industrial estate, so the actual Alexandra Street was knocked down for this development. They would probably have been the same type of housing as Wren Street, Childeray Street, Norfolk and Suffolk Streets, which surround it, and still stand today – small terrace houses with no front garden and back yards. It would have been a working class area, certainly not large establishments with servants, so your Grandmother would not have been part of an army of servants, more likely the only one. It is about a 10 minute walk to the Robson Maternity Home from there. hello, I too was born in Robson Maternity home on Jan 28 1959. I was born with a double cleft lip and palate and had to be taken to Durham Road Children’s Hospital. My Parents Brian and Marlene Cox and my 2 brothers all lived in Alexandra Street. They were indeed back to backs, with no front garden or bathroom with a small back yard where dad kept pigeons. We had a happy childhood but times were definitely harder then. I recently discovered that my father was born at the Robson Maternity home on 8th Sept 1920. His unwed mother worked as a domestic servant in Alexandra Street. He never knew who his biological father was. Does anyone know what sort of neighbourhood this was back in the 1920″s? Three of my children were born in the “Robson”, I have horrible memories of the only toilet available for us to use. Not very convenient when you”d had an enema!! I remember you from Tilery school Doreen, I”ve posted a school photo on the site T9901, you are on it standing next to Dorothy Gill. Interestingly, I too was born at the Robson Maternity Home in 1939 (October) born in Stockton later moving to Norton. My daughter was born at the same maternity home in 1960, also my son was born in l963(Christmas day. Now how about that for coincidence?? I was born at the Robson Maternity home in 1939. I grew up in Norton and attended Richard Hind. I was married in 1959 at St Michaels church. My oldest daughter was born in the home in 1960 and my son in 1963. I have lived in the USA since 1966 and currently live in Houston, Texas. I visit friends in the Stockton area frequently. I was born in the Robson Maternity home, I was the first baby of the year – bang on the bells 01/01/1951. My mother went mad because the year before you got a silver cross pram and I only got a half crown and a silver spoon which I still have to this day. I always watch for where the first baby of the year has been born. I was born at the Robson maternity home in 1960. I lived in Fairfield for 5 years until my family moved to the USA. I currently live in Texas but visit family in the Stockton area as often as possible. I was born at the robson merternity home that my mother told me about in 1964 anyone knowing of what became of the sisters please let me know . jpm. Alan Waite, I was also a Marine cadet at TS Fortitude around 72-74ish, remember the back stairs upto the Marine Officers office, and the cupboard they kept the uniforms in? However you are mistaken about the building, The Robson Maternity Home / Stork Hotel was next door, on the right as you looked at Fortitude. After a few postings when I was living in the USA I am now back living in Scotland. It made me smile at the comments from Harry and Terry Dickin calling us 60″s babies youngsters and calling themselves silver tops…news for you terry and harry ..I”ve now joined you. At the ripe old age of 48 (in 2008) What hair I have left is grey/silver. I do get to Stockton to see family, but never been around to look at this area, may be worth a look this weekend. I was in the sea cadets in the 60″s Alan Waite. It was indeed the T.S. Fortitude, but to my recollection was next to the maternity home (to the left). I have a copy of the group photo of all the cadets and marines that you mentioned. Will dig it out for picture stockton. I think it was taken in 1966/7. I remember five of us cadets going on a cruise up the scottish coast on HMS Tiger a real cruiser battleship. I used to shout out orders to cadets using my Captain Pugwash impersonation. Happy Days. I was born there 12 April 1940. My mother lived in Norton and my father away at war. I moved in next door [Stockton & Thornaby Hospital] for 6 months in 1947 when I broke my leg playing at Billingham Infants School. I was born at Robson in 1938. My parents must have been living in Stockton at the time? Later moved to Haverton Hill…happy memories. My son stephen was born in the Robson Maternity home 18th Dec 1951 when we lived in Vine Street, Parkfield. We now live in Perth Western Australia but often think of the happy days spent in the area, but surprised at all the changes being made to old buildings that could have been preserved. After reading Christine Carters comment I wondered if her husband was related to Fred Carter and his wife Polly, Son Fred and Daughter Betty who lived in my Grandads parlour in Grove Street in the 1930s. Fred and I were mates in that period often playing football in the back street, its along time ago but we had some good times those days. I knew a girl called or Eleanor (or Helena) Duncan who lived in Pearson Street, near Lindsay Street. Perhaps this is the same family? My mam was born in 1935 in robson home her name Winnifred Duncan. She was brought up in Pearson street. Her mam was Winnie and her father was John Duncan. Her sisters were Ida, Mabel & Laura. Brothers John and Jimmy – does any one remember the Duncan family? The cross country runner was my brother Dennis born also at the Robson I think but a few months after Harry Rhodes at the beginning of January “30. Frank Showell”s Eagle Club (in the room above garage behind the Stockton Vicarage in RT Heselton”s days) was the remarkable work of Frank and his wife. It would seem that I must bow to Ken Sawyer”s claim to seniority in our respective arrivals at the Robson Maternity Home. A 1927 definitely beats a 1929, and so I relinquish the crown of Grandfatherdom to him, until some other “Ancient”submits a more valid claim. I seem to remember the name Sawyer as being a better than average cross country runner during the mid to late fourties when I was running for Frank Showell”s Eagle Club. Exhausting days! My son Ian was born in the Robson on April 1st 1967, in the corridor, with screens around, as the delivery room was busy! That was in the days when, if your husband took you there during the night, he was told to ring back in the morning to find out if the baby had been born. As it was April Fool”s Day, the nurse wanted to tell him I had given birth to twins! And yes, 10 days occupation was the norm for first babies. My second son Neil was born in the fairly new North Tees in 1973, and I cannot compare the two experiences, the Robson was far more homely and reassuring, because your own family doctor was actively involved. Luckily North Tees discharged you after 24 hours for a second child. Back in August 2005 Harry Rhodes wrote: Reading through the Birth Dates of you youngsters I feel rather like Gran”dad to the lot of you. He put in his granddad claim for 1929. I appeared on the Stockton scene in the Robson at the end of August 1927. Any advances or going further backwards in history? i was born at robsons maternity home,on the 28th july 1963.i moved to middlesbrough in 1979. Not sure if you will get this after so many years but I was born there on 16th February 1968! Both my wife Beverley was born there (1960) and myself (1956) – I bet back then they did not have C diff and MRSA to contend with. I recently came across a Health Report in Stockton Library for the period 1948-50 which drew attention to the inadequate maternity facilities in Stockton. At that particular time the Robson Maternity Home only had 21 beds.Despite this, and no doubt due to financial stringency in the post-war years, it was 1968 before Stockton got its new maternity hospital on the North Tees site. Happy to say I”m yet another Robson lad !! 16 April 1948. My parents (Oliver & Marina)& sister (Ann)had returned to the UK from Argentina (Dad having served with the Merchant Navy)& lodged with the Gilchrist family in Lightfoot Grove for at least a couple of years after I was born. Life must have been a struggle back then, but I can remember my mum telling some hilarious stories about overcoming the various hardships!! Linda Friesen…I too was born in the Robson in October 1950, the 26th….the same day as you perhaps?? I was born in the Robson in 1953, and went to live in Skinner Street before we moved to Norton. I was born in the Robson in October 1950. We lived on Garabaldi St. until my parents (Fred & Mary Graves(Hopper) moved to Canada in 1956. I was born in the Robson Maternity Home in 1954. I live in the prairies of Canada now. I was born in Barton House in 1953. My sister was also born there,in 1955.It must have been a hospital as well because I had my tonsils removed there in 1957. I was born at the Robson Maternity Home 31 March 1959.
there were two nursing homes in Yarm Road,near to the Robson Maternity Home. One was Barton House,the other was The West End. I think that maybe the Maternity Home that Ken Rhodes is thinking about was called Barton House.That name seems to ring a bell for me. Yes Ken there was another maternity home in Yarm Lane called “Barton House”. I am sure it existed as my mother told me I was born there in 1945. I believe it later became the offices of the solicitors Archer, Parkin and Townsend which must have been around 1963 and which coincidentally I ended up working for. Ken Rhodes. The name is Barton House. I believe it was a private Maternity Home. I was born in the Robson Maternity Home on 31st December 1932.I think most people in Stockton around that time were born there/although there was another Maternity Home on Yarm lane, im afraid its name escapes me.Maybe Stan Rhodes or Bob Dicken can remember. I was born in the Robson jan 16 1934 and according to my mother caused quite a stir among the staff because of my exceptionally strong heartbeat ! I was born at “The Robson” on May 2nd 1945. My mother Nora, told me she had red, white and blue cake there when the war ended on May 8th. I was born at the Robson Maternity on 21/7/47 and lived on the Newham Grange Estate until I married in 1968 and emigrated to Australia. It was nice to see a picture of the Robson Home. My husband and I are renovating the Robson Maternity Home into private dwellings for our four lovely children. Two of my children have Muscular Dystrophy. We cannot wait to move in. So our children have a bigger space to whiz about in there powered wheelchairs. I hope my children have years of pleasure in living in this lovely home, as so many people have fond memories of this house. Almost every-body we know, they know of someone who was born in this house. I will in the near future send some photos of the house I am sure we will receive some comments. We are proud of the fact that this house has given happiness to so many people over the years (and relief). My brother Kevin and I were both born here in the 1950″s – in the annexe. It would seem that a good portion of fellow Stocktonians were born here too. At the time, my parents were living in Baring Street, just off Parliament Street, only a few hundred yards away from the home. A short dash for my mother, and it meant she was probably home in time to do my Dad”s tea! I was born at Robsons maternity on the 12th august My mothers last name was Eddy. We lived in Camden street for a while. I was born at the Robson in 1946. We then lived in Woodland Street. Went to Sunday School at Lightfoot Grove Church, so the Robson was nearby, often wondered what went on in there, 3 children and 4 grandchildren have given me some idea. Karen Ransom – your mother was quite fortunate. The street next to Bowesfield Lane, which backs onto it, Lawrence Street where it joins Yarm Lane, the garage at the end was bombed, probably the night your mother was born. Close to the Robson, about 100 yards away. There was a night watchman in his hut that night at the end of Lawrence Street and the bomb came down almost on top of him. An ambulance later took him away and onlookers at the scene reported the ambulance coming back half-an-hour later for his leg…this was the night Northcote Street and St Peter”s Road were devastated…on a lighter note, I was also born in the Robson as was my sister and brother. When the maternity home closed it became the Stork Hotel, then private flats housing mainly unfortunate people subsisting on welfare benefits, then derelict, almost burnt down and the last time I saw it in a very sorry state. The naval establishment next door was knocked down in 1995 and is still, I believe, what could be best described as a bomb site. Planning permission was granted for a mosque to be built on the site of the naval establishment, but was never built. It is lovely to see a picture of the Robson. I am searching for a 1/2 sister who was born there in 1940. I shall print off this picture and keep it along with the only photograph I have of my 1/2 sister with our grandmother. This site has become the first place I head to every morning, cuppa in hand of course! I hail from Billingham and enjoy reading all the daily comments. I”m not a local but have lived here in Stockton for nine years now, in answer to Adrians question from Rhodes Island, USA.The building is as we speak being renovated after being empty for quite a while. During a discussion last week, at a residents meeting, we were told that it will be a private residence, that is being adapted, for two children who have physical disabilites. Nice to know that such a lovely old building is going to make a difference to peoples lives. I was born in the Robson Maternity Home April 1961, we lived in Gayles Street (nearby) before moving to the Hardwick Estate in the mid 60s. Like Adrian, I was also a Royal Marine cadet at the establishment next to the home (TS Fortitude?). Been living in New Zealand since 1990. I too am surprised at Bob Dicken`s findings regarding the lack of computers amongst the Teesside “Silver Tops”. Most ex-pats in Spain fall into the Silver Top variety and almost all of my friends have a PC. Maybe it has something to do with the need and desire for easy communication Bob. What a delight to be contacted by such nice people and to have so many pleasant memories revived. Peter, of course I remember you from the days when we were Apprentices at the Furness Yard. Picked out your name some time ago when there was a bit of confusion over the identification of the “Southern Harvester” and the “Southern Venturer”. I think that we both jumped in with almost identical howls of protest. I do have a couple of photographs of some of the lads of those days. Harry Mellor, Ozzie Plant, Albert Jeynes. I am still in contact with one of our year Stan Bassett who now lives in Lincoln. Hope to read more from you Cheers! And lovely to see your name Bob. You will not remember me but I remember you when you were called “Bobby” at Richard Hind Junior School, before you went to Holy Trinity. I have a sort of feeling that St.Peter”s Road came into it somehow. I have to agree with you that the Computer is a wonderful tool for keeping the old brainbox ticking over. I feel that if Governments supplied “Old Stagers” with Computers, there would be a lot less sickness (mental and physical) amongst the mature age groups. I have been impressed with your contributions to this site, and am fascinated with just what an interesting area Stockton and district is. Of course, I had to move away twelve thousand miles to find this out. Cheers! Harry R.
I didn”t see the light of day in the Robson Harry, but I was born in the same year 1929 in U S = upstairs. Between 1945 and 1950 we built ships in the Furness yard, remember those days? They were good but busy years. Reading through the Birth Dates of you youngsters I feel rather like Gran”dad to the lot of you, (with the exception of Bob Dicken) as I saw the light of day at The Robson way back in 1929. Time, I think for me Clay Pipe, Cloth Cap and Shawl. I was born in the Robson Maternity Home on September 7th 1944. When I was a kid my sister used to tell me my mother got the wrong baby; in later life I used to tell her she was right! I was born in the Robson Maternity Home in 1938. During the earlier part of my life there were members of my family who wished I had stayed there. My mother was a nurse at the robson maternity home and she loved every minute of it, her name is Jean Skipp. Would anyone know which doctor attended to the deliveries at the Robson Maternity Home in 1920, and where would the medical records & patients names be recorded and filed now? I was born in this maternity home in 1963, as was my sister and cousin in 1960. How things have changed my mother told me that she had to stay in bed for ten days after we were born or suffer the wrath of the midwives. I was born in Robson Maternity hospital in January 1947,and my brother Keith and sister. This picture must be post September 1962 as that was when Ford launched the original MkI Cortina. I was born in the Robson in March 1960. It has been sometime since I have been in Bowesfield Lane, having lived in Chester Le Street, Preston, Edinburgh and now in Rhode Island, USA. I was a Royal Marine Cadet in 1970-74 next door the the Robson, it was then a Hotel called of all things “The Stork Hotel” . What is it now and is it still standing? The building in Bowesfield Lane was given to the town by local businessman Isaac Robson. Dr M”Gonigle ran the Maternity and Child Welfare clinics throughout the town to help those women who were not able to pay for a private doctor. Usually women had to pay to go into the Robson, but Dr M”Gonigle could get poor women in for no charge, if their home conditions were unsuitable. I was born in Robson Maternity Hospital in March 1949, lived in Yarm Road then moved to Newham Grange Estate. I was born in the Robson Maternity Home in 1930. My mother was born in this maternity hospital in 1945. Are you any relation of Gary Featherstone? He’s an old friend that I am trying to get in touch with.